My friend's boyfriend told her that this morning too! You never notice how much people get into V Day until you get to have one without anything going on... you found the heart in the road and she was drawing hearts all over the tablecloth at lunch while she was talking. yeah, i resist the temptation to go overboard on v-day, cuz it's way overhyped. seriously, i would much RATHER not get roses & chocolates (well, o.k. i'd have to get my head examined if i refused CHOCOLATE) but, you know what i mean..
v-day's not just for luvuhs, ya know...but, i think we should love each other for the other 364 days outta the year! 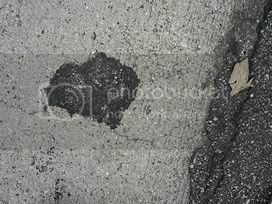 oh, and that asphalt stain really freaked me out, glad i had my camera! My parents sent me some chocolate and a 4-in-1 screwdriver for valentine's day. Then I ate lunch with my ex-girlfriend. You're right - it's not only for lovers. I got to see a lot more from the outside! I DID get chocolate, from my Dad! Yay! A heart shaped stain on the concrete .... heh. It is also a day when 13 year olds send their mommies flowers out of the blue. And 23 year olds call just to say Happy V-Day. So, my day was perfect! you hatched 2 veeeeeeeery good eggs!